Are the Expectations Too High? November is here, which means college basketball is back. 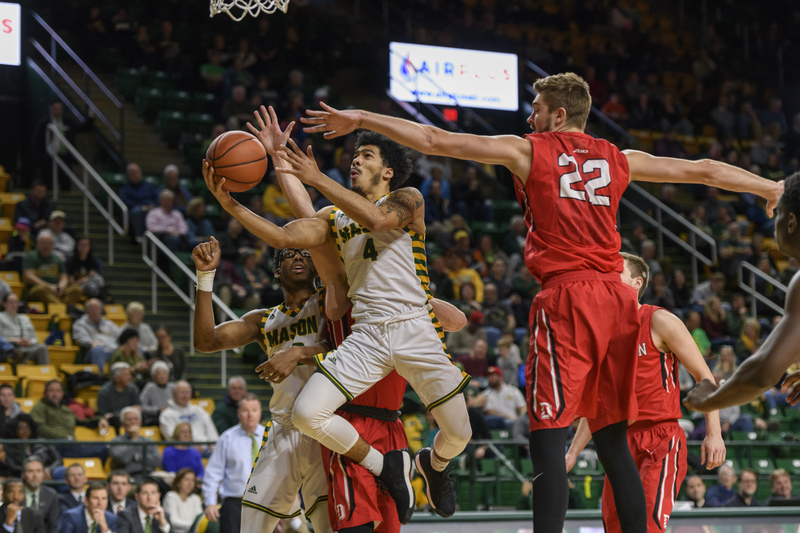 At Mason, both the men’s and women’s basketball teams are coming off their best regular-season finishes since joining the Atlantic 10 in 2013, finishing fifth and fourth respectively. On the men’s side, the entire roster is returning from last season. The team is getting much-needed help down low in redshirt junior Jarred Reuter, a transfer from a high-caliber University of Virginia program who was forced to sit out last season due to NCAA transfer rules. The coaching staff also brought in three freshman guards, including a seemingly overlooked and under-recruited backup point guard in Jamal Hartwell II out of Los Angeles, California. Jason Douglas-Stanley, a sharpshooter and former high-school teammate of sophomore forward Greg Calixte, has also joined the team. Coming off of last season’s run, there has been a palpable buzz around this season’s outlook, as the team was picked to finish 10th in the A-10, and senior point guard Otis Livingston II was named to the All A-10 Second Team. In the preseason poll, the Patriots were picked to finish fourth, a significant jump compared to being the 13th pick in 2015-2016 and 12th in 2016-2017. Livingston was also named to the Preseason All A-10 First Team, making him Mason’s first-ever All A-10 Preseason First Team selection. 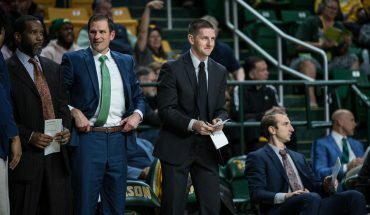 Andy Katz, the former ESPN senior writer and current NCAA correspondent, picked Mason as his sleeper team for the 2018-2019 season. With these expectations comes pressure the Patriots have not faced since their NCAA Tournament runs. Fortunately for Mason, several factors seem to be in play that could lead to success for the men’s team. Every four years, the NCAA allows college basketball teams to travel abroad and face off against international teams. This past summer, the team traveled to Spain, where they took on senior teams throughout the country. That early competition gave the coaching staff an early look into what their best lineups might be, and the minutes played over in La Roda, Toledo and Barcelona hopefully allowed the newcomers to gain valuable experience alongside the returning roster from last season. Building off last season’s impressive list of nonconference opponents such as Louisville, Auburn and Penn State, head coach Dave Paulsen has managed to schedule several games against quality programs from around the country that should help the team greatly as they prepare for conference play. 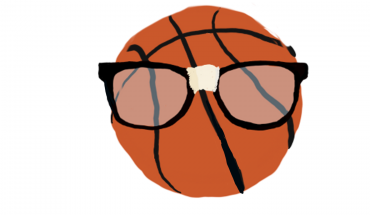 They are taking on three NCAA tournament teams from last season, including the University of Cincinnati, who are the American Athletic Conference champions; the University of Pennsylvania, who are Ivy League champions; and a Kansas State University team that went as far as the Elite Eight. In addition, they have a matchup against either Baylor or Ole Miss in the Emerald Coast Classic, as well as a home game against the University of Vermont, who fell to the upset specialists University of Maryland Baltimore County in the America East Conference tournament final. Another advantage for the Patriots is the overhaul that several teams in the A-10 endured during the offseason. Last season’s regular-season champs the University of Rhode Island (URI) lost their head coach Dan Hurley to the University of Connecticut, and saw their top scorers Jared Terrell and E.C. Matthews graduate. The A-10 conference tournament champions Davidson College lost their top scorer and conference Co-Player of the Year in senior Peyton Aldridge, and the third team to represent the conference in the NCAA tournament, St. Bonaventure University, saw their All A-10 First Team guards Jaylen Adams and Matt Mobley graduate as well. Such changes among those top teams has caused some to believe that this will be a down season for the A-10, but that may not be the case. Davidson still has Kellan Grady, who could very well wind up as the conference’s Player of the Year. Despite their departures, URI appears to be in great shape with the experienced NCAA tournament players in Fatts Russell, Jeff Dowtin and Cyril Langevine and a coveted recruit in forward Jermaine Harris. From a talent standpoint, Saint Louis University appears to be a real threat to win the conference for the first time since 2013-2014. In addition to returning their top scorers and rebounders in Javon Bess and Jordan Goodwin, the Billikens should receive a boost from transfers Dion Wiley (University of Maryland) and Tramaine Isabell (Drexel University). Getting this group to mesh will be the real challenge for head coach Travis Ford. If they succeed, it will likely earn them a spot in the Big Dance in March. One final contender for the conference title this season will be Saint Joseph’s University, who finished strong last season and nearly reached the A-10 championship game despite injuries to Lamarr Kimble and Charlie Brown Jr.
Kimble and fellow redshirt junior Pierfrancesco Oliva have NCAA tournament experience after their run in 2015-2016. After last season’s impressive finish, head coach Phil Martelli has all the pieces to make it there again. In the past couple of seasons, the A-10 has only received three bids to the NCAA tournament. In the 2014-2015 season, six teams made it to the Big Dance. Davidson, URI, Saint Louis and Saint Joseph’s all getting in would exceed the recurring bid count of three, but such a scenario does not seem like a long shot. However, a fifth team getting in does not seem likely, and that is where things become challenging for the Patriots. A competitive nonconference schedule always looks appealing to the 10-person selection committee that controls the fate of teams who fail to win their conference tournaments but accomplish enough to be considered for the NCAA tournament. Teams have to win the nonconference games for them to merit any meaning, at least the ones they are favored in. Mason did not start out well in that regard. A loss to an NCAA tournament team in UPenn is not in itself a failure, but the manner in which it played out was discouraging. The Patriots somehow managed to attempt only eight shots from beyond the arc, and of those, made just two. That will not be enough to keep up with the likes of Davidson and URI, who each made 13 threes in their season debuts. Two of the Patriots’ best outside shooters last season, senior Jaire Grayer and sophomore Goanar Mar, combined to shoot 1-4 from 3-point range, and their top sharpshooter, Livingston, did not even attempt a three. To make matters worse for a team that finished the regular season tied 299th in the country in 3-point percentage, freshman scorer Douglas-Stanley did not even play. Mason also appeared undisciplined in their home opener, with 17 turnovers and an egregious 23 personal fouls. Hopefully, they are just working to knock off the rust, as other A-10 teams finished with similar numbers in their season debuts, but it would have been to their benefit to get such sloppy play out of their system during the trip to Spain. To take a glass-half-full approach, the men’s team lost at the buzzer to an NCAA tournament team and received 25 points from a five-man bench. In a more pessimistic outlook, the Patriots once again shot poorly from outside and gained hardly any minutes from Grayer and Calixte. 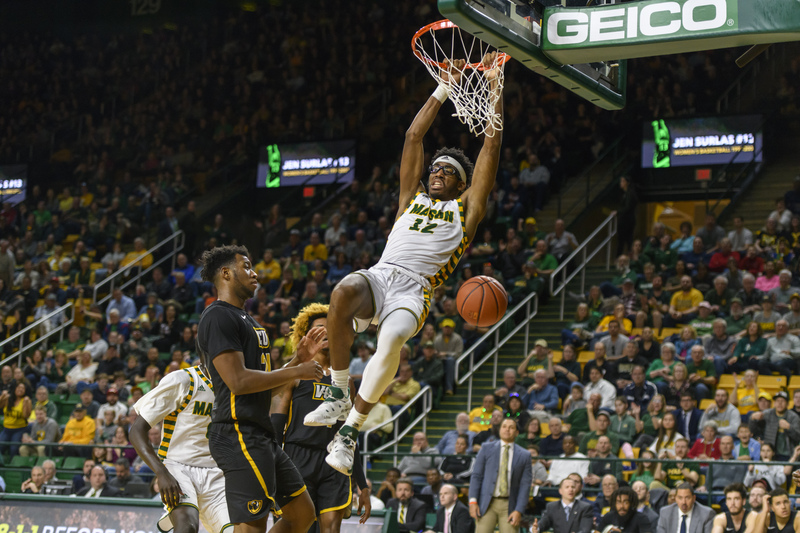 If their outside-shooting woes continue and guys like Calixte and Mar fail to make an impact, Mason would most certainly have to resort to winning the A-10 Championship, which would be a mighty mountain to climb. Let’s hope it does not come to that.